Machine bed: Of cast iron, wide-legged prismatic guide. For vibration-free work even at high loads. Rear flange for mounting the mill/drill head PF 230. Covered lead spindle. Headstock: Of die-cast aluminium. 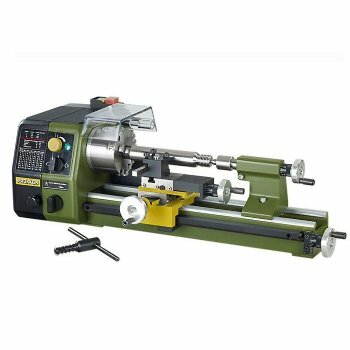 Precision bearing mounted main spindle (run-out without chuck 1/100mm (0.0004")) with 10.5mm (13/32") opening. Chuck side 70mm (2 3/4") hollowed to 14mm (0.56"). With MK 2 bore. Rotary switch for engaging the automatic feed via lead and feed spindle (optionally 0.05 or 0.1mm/rev. (2/100" or 4/1000")). Tailstock: Of die-cast aluminium. Sleeve Ø 20mm (3/4"), retractable up to 30mm. With millimetre scale, MK 1 bore and live centre. Support: Bed carriage made of die-cast zinc. Cross slide and top slide of steel (adjustment 60 or 45mm (2 3/8" or 1 3/16")). Turning tool post for cutting tools size 8 x 8mm (5/16" x 5/16"). Drive: Quiet DC special motor with 3-stage belt drive for 300 - 900 and 3,000rpm. With additional speed control (full-wave electronics) continuously adjustable to 100 - 300 or 1,000rpm, depending on belt ratio. Clockwise - anticlockwise rotation. Main switch with emergency stop function and restart protection. Lathe chuck: High quality 3-jaw chuck as per DIN 8386 Class 1 (concentricity tolerance 0.04mm (0.002")). Capacity through reversing jaws from 2 - 75mm (5/64" - 3"). Including lathe chuck guard with safety shutdown. Handwheels: Of aluminium, with adjustable scale ring (1 division = 0.05mm (.002"), 1 revolution = 1mm (3/64")). Thread cutting device: With change gears for left-hand and righthand threads of the most important metric pitches (0.5 - 0.625 - 0.7 - 0.75 - 0.8 - 1 - 1.25 - 1.5mm). New system accessories. Made in Germany.